Enceladus, Saturn’s sixth largest moon, is a cold ball encrusted almost entirely in ice. One of its defining features are geyser-like jets of water vapor that shoot out of its surface. But a new analysis suggests those jets are not jets after all, but something odder: curtain eruptions. The jets may have just been an illusion, write scientists in Nature. Joseph Spitale of the Planetary Science Institute and colleagues noticed that photos of the “jets” taken by the spacecraft Cassini often had a faint glow in the background. 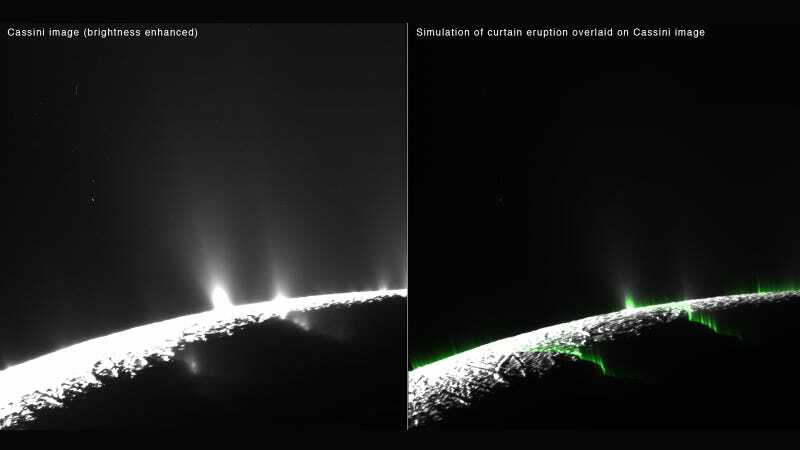 When they looked more closely at the data, they realized there was an alternative explanation: The bright “jets” were actually folds within curtain eruptions that spew out of miles-long cracks on Enceladus’s surface. What looked like discrete plumes was an illusion from 2D photos—scientists may have been wrong this whole time, which just shows how difficult it is to draw conclusions for the little data we have. These eruptions matter because they are clues to what lies in the ocean below the ice. Enceladus’s ocean, in fact, might harbor molecules that could support life. A second study out this week uses Cassini data to probe the contents of the eruptions. Their best guess is soda- and salt-rich water with a high pH. The high pH might be the result of serpentinization, a process in which certain rocks dissolve in the water, raising the pH and also creating hydrogen gas (H2). In turn, H2 can support the formation of organic molecules. All of these are just tantalizing hints as to what lies beneath the surface on a moon far away. Before Cassini, we didn’t even know that Enceladus had a large salty ocean—now it’s one of the leading places to look for alien life in our solar system.